Khammam, Apr 01: Telugu Desam Party headed by Andhra Pradesh chief minister N Chandrababu Naidu, might have succeeded in delaying the release of controversial political film 'Lakshmi's NTR' made by maverick director Ram Gopal Varma in Andhra Pradesh by moving the high court. But he could not succeed in killing the enthusiasm of the people of Andhra to watch the film. Thousands of people who shuttle between Hyderabad and Andhra every week end evinced interest in watching the film in Telangana, during their visit to the joint capital in the weekend – on Saturday and Sunday. What is more interesting is that thousands of Andhra people in the borders areas of Telangana heeled into Khammam to watch RGV's film just out of curiosity. 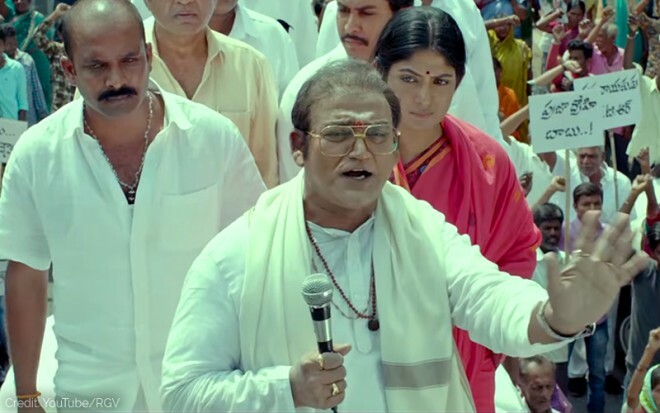 The film, based on Naidu's conspiracy to degrade his father-in-law N T Rama Rao, attested a lot of curiosity among the viewers of Andhra and brought rich dividends to theatre owners in Khammam. In the last three days, the theatres in Khammam ran to packed houses off the visit by Andhra people in large numbers. According to a media report, people from Nandigama, Tiruvur, Mylavaram, and Nuzivid Assembly segments in the Krishna district and Chintalapudi, Polavaram, and Jangareddygudem in the West Godavari district of AP thronged theatres in Aswaraopet, Sattupalli, and Madhira to watch the film where it was being screened. Around 200 villages in the two AP districts are within a 30-km distance from these three towns in Khammam district. Sources said YSR Congress party leaders arranged the facility for the transport of people from these areas to Khammam to see the film. Even if the film makes one per cent difference in the poll prospects of YSRC, it is more than enough for it!